Canis lupus lupaster, the African wolf. Photo by Cécile Bloch. It wasn’t long ago that wolves were thought to be found only in Europe, Asia, and North America. However, there were always wolf-like golden jackals that had scientists perplexed for many years. Earlier texts listed these animals as Canis lupus lupaster, usually called the Egyptian wolf, but by the late twentieth century, it was assumed that they were nothing more than wolf-like golden jackals. The scientific name for this wolf-like golden jackal was Canis aureus lupaster. Then, in the January of last year, a study that compared the mitochondrial DNA of wolves and golden jackals, including these wolfish ones, revealed that the wolfish jackals were not golden jackals at all. Instead, it was found that they represented a primitive mitochondrial lineage within Canis lupus. So they were wolves after all. However, that study also revealed that these wolves were also found in Ethiopia. Not to be confused with the critically endangered Ethiopian wolf (Canis simensis), the African wolves were an early branch of the Canis lupus species that invaded Africa and then became genetically isolated from the main wolf lineages of Eurasia and North America. This exact same issue exists with Himalayan and certain wolves from the Indian subcontinent. Their mitochondrial lineages are very old. The discovery of Canis lupus wolves in Ethiopia was a bit of a shock, and the question that everyone want to know was exactly how extensive the African wolf’s range was. Golden jackals are widely distributed over much of North and East Africa, as well as much of southern Asia, including the Caucasus, They are also found in the Middle East up into Turkey and into Europe as far north and west as Hungary. However, there was a distinct possibility that some of these “golden jackals” were actually wolves. And that’s exactly what has been found. In the West African nation of Senegal, there are wolfish golden jackals and more gracile golden jackals. 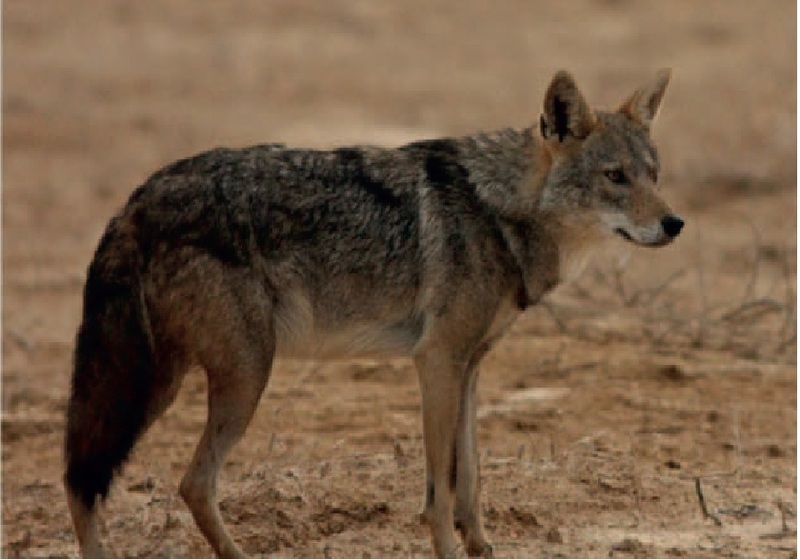 And a recent study in PLoS ONE looked at some mitochondrial DNA samples from both types of golden jackal from Mali, Algeria, and Senegal and compared them with samples from wolves and other species from the genus Canis, including golden jackals from East Africa and India. The study found that there were four main mtDNA lineages in Canis lupus: a Holarctic wolf and domestic dog lineage, a lineage for certain wolves from the Indian subcontinent, a lineage that included certain wolves from the Himalayas, and an African wolf lineage. Canids with the African wolf lineage were documented in Mali and Algeria, but the ones in Senegal were actually subjected to an intensive field survey. It was discovered that the African wolves had very different body language from typical golden jackals in the region. African wolves are quite aggressive toward golden jackals, but they have different ways of expressing that aggression than one normally sees in golden jackals. Wolfish threat posture from an African wolf (Canis lupus lupaster) on the left. More golden jackalish or coyote-ish threat posture from a Senegalese golden jackal on the right. To make things even more interesting, it was discovered that some Senegalese golden jackals– animals that look and act like golden jackals instead of African wolves– have African wolf mtDNA. That means that African wolves and golden jackals do interbreed. And that also means we’ve just discovered a Canis lupus/Canis aureus species complex! We still haven’t determined how much crossbreeding between golden jackals and African wolves has occurred, and we still haven’t looked at their nuclear DNA markets to see if they are more extensively crossbred with each other. This study also found a wide variance in mtDNA between golden jackals in East Africa and India, which also needs to be examined. The study found that African wolves are the oldest mtDNA lineage within Canis lupus. It doesn’t necessarily mean that wolves evolved in Africa, but it does show that African isolation has done fairly good job in preserving this lineage. These findings almost beg for a study that examines a large sample of nuclear DNA, if not something like the genome-wide comparisons that were performed on wolves and coyotes. So wolves do exist in Africa, and they aren’t just in East and North Africa. They are in West Africa, too! Wow; that is really exciting news! It opens the door for all kinds of new speculation and analysis. This is exciting– it is a real life example of the complexity that theoretically can exist in the wolf- dog complex. Keep on it! I wonder about the golden jackals that were used to create the Sulimov dogs. Were they actually wolves? Probably not. They were Central Asian golden jackals. wild speculation here is that the original domesticated wolf came from “Africa” — that we will at one point find that the Tibetian/Asian/Egyptian/Ethiopian/African wolves are just as “mixed” as the N. American wolves. That they are “like us” — they may have pockets of genetic isolation but that where they “meet” they can and did interbreed and continue to do so. It is only because so many wolves have been exterminated and pockets isolated that there is less “continuum” obvious. It would make sense that as “we” exited Africa, the dog came along. It also points out that the wolf is second only to H. Sapiens in terms of global presense — they are everywhere we are and even got us to take them where they couldn’t get on their own (Australia & Antartica). Yes. I think that might be too much to say that wolves come from Africa. Jonathan Kingdon hypothesized in Arabian Mammals (1990) that wolves from that area were the original domestic dog source. I argued against it, but we really don’t know enough yet to reject this odd idea. I wasn’t saying wolves come from Africa, but that the first domesticated one did. It’s possible. Mitochondrial DNA isn’t everything. Dogs and these wolves don’t share mtDNA. But they need to be examined as North American wolves and coyotes were at UCLA to answer that question. Amazingly interesting post, thank you.